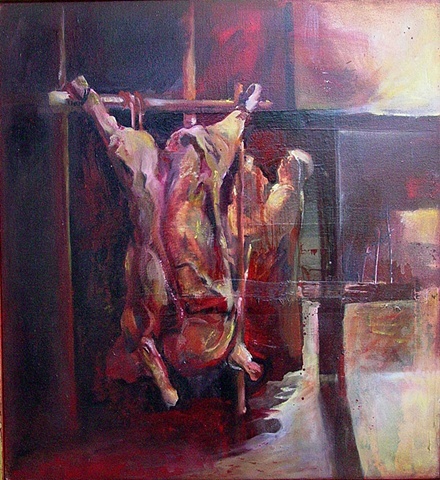 This painting is a reference to Rembrandt painting called, The Carcass of Beef / 1655. He knew the biblical truth that life requires sacrifice, ultimately the sacrifice of God's Son for sin and death. Rembrandt influenced other artists, among them Delacroix, Daumier, Soutine, and Francis Bacon. Bacon painted a pessimistic series called Slaughter House Earth after the World Wars. In this tradition, my painting also deals with the reality of sacrifice as an integral part of life. A priest/butcher carries a side of beef. The sacrificial system that God instituted for His people in the Old Covenant pointed to the sacrifice of Christ. It was a bloody covenant (because our life is in our blood) that exhibited the seriousness of man's sin and separation from God. Mankind is doomed to die. The cross beams allude to the hope and resurrection of The Sacrificial Lamb of God.